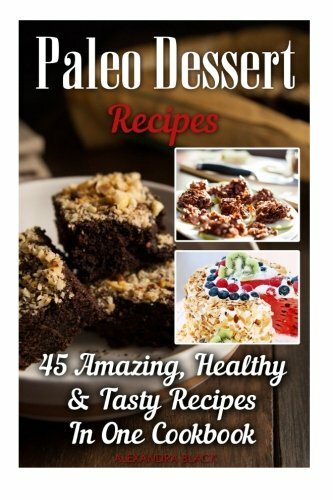 Paleo Dessert Recipes 45 Amazing, Healthy &amp; Tasty Recipes In One Cookbook If you have always wanted to try out the Paleo diet, there is no better time than the present moment to do that. This book includes 45 of the most delicious and yet not-fattening Paleo desserts, helping you lose all that extra weight. You will find that the recipes included in this book are easy to make and they do not take too long before they are ready. Plus, the ingredients are 100% healthy, which makes the whole experience even more interesting to try out. Here is a preview of what you will discover: Ten amazing recipes of ice cream - containing only healthy ingredients, ice cream is no longer off limit while you are following the Paleo diet Five yummy Paleo, gluten-free cake recipes - even if you are following the Paleo diet, this doesn't mean that you can't have cake Ten easy-to-make cookie recipes - you can stick to the Paleo diet and enjoy mouth-watering cookies, such as the ones with chocolate chips Ten incredible fruit dessert recipes - these are easy to make and yet filled with healthy nutrients; you can eat dessert without feeling guilty anymore Ten savory dessert smoothie recipes - all you need is a blender and the most delicious recipes come to life Prepare yourself for one of the best resources that was ever written on the subject and do not hesitate to read it until the very last paragraph, discovering all of the 45 Paleo dessert recipes presented in there Download your E book &quot;Paleo Dessert Recipes: 45 Amazing, Healthy &amp; Tasty Recipes In One Cookbook&quot; by scrolling up and clicking &quot;Buy Now with 1-Click&quot; button! Tags: Diet Desserts, paleo diet, Delicious Paleo Dessert, Simple Paleo Recipe, weight lose, weight lose desserts, Recipes for the Paleo Diet, Simple Paleo Recipe Series.